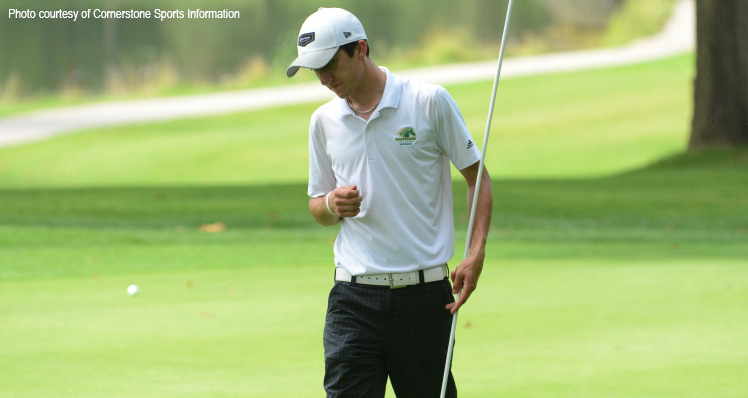 WYOMING, Mich. — The Marygrove men’s golf team entered WHAC Jamboree One shorthanded as eligibility and health loomed large over the squad to begin the fall campaign. Junior leaders Michael Kanalas and Tyler Newell were the only two Mustangs to hit the course Saturday (Sept. 5) at LE Kaufman Golf Club in Wyoming, Mich. as the Green and Gold went without a team score at the first conference event of the season. Newell checked in with a season-opening round of 81, one shot off of his career-best outing of 80. The 81 was a product of a stellar front nine that featured Newell hole out on his approach for an eagle on No. 9. The impressive eagle allowed Newell to take a 37 into the turn after nine holes and kept the junior on pace for a career-best round. Newell would run in to a bit of trouble on the back to finish with an 81. Kanalas followed closely behind Newell with an impressive season-opener as well. The junior capped off a balanced day with a round of 83 â seven shots back of his career-best round of 76. Like Newell, Kanalas breezed through the front nine, finishing the opening half of the day with sub-40 score. Kanalas posted a 39 on the front, two back of Newell, as the pair kept pace with the best in the WHAC for the first half of the day. In a mirrored effort of his fellow junior teammate, Kanalas had an up-and-down back nine despite checking in with a low 80’s round to begin the season. Assistant coach Ronnie Pollack, Jr. traveled with the team and spoke candidly about the player’s rounds at the conclusion of the jamboree.